The Story: Does Flossing Even Work? WHY Isn’t There Good Research on Flossing? 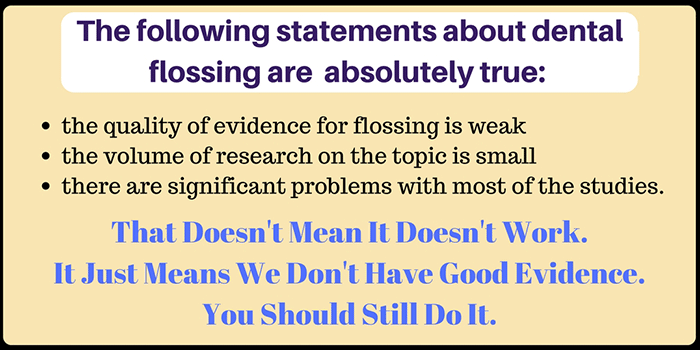 You need a very large body of patients to have any statistical significance, and how many people do YOU think are going to volunteer to be in a study about flossing? Hmmmmm? Yeah, that’s what I thought. NO ONE. Even worse, the study needs to cover a long period of time, like at least a couple years, because gum disease and cavities don’t usually form in a few days or weeks – they can take months or years to develop. How many people do you think will volunteer to be in a study on flossing for 3-5 years? Again….NO ONE. Oh yeah, and you need one of EACH of these groups that has zero signs of even slight gingivitis, and one with mild gingivitis, and one with early gum disease, and one with moderate gum disease, and oh yeah, we should have one of each group that also uses an electric toothbrush to compare against another group with manual brushes, and……holy crap where are we going to get all these people since 50% of the population doesn’t even see a dentist regularly???? I mean………c’mon people!!! You actually expect that anyone is going to pony up the money to study this rigorously? And even if they do, where are you going to get all those people to take part for a study that lasts for years? IT AIN’T GONNA HAPPEN. First, let’s be brutally honest. Most of you aren’t flossing. Heck, I’m not very good at flossing consistently. Of course, there’s a good chance that contributed to the root canals, fillings, and crowns that I’m having to get on a bunch of teeth this year. Or maybe not, based on the evidence. But hey, do as I say, not as I do! Simply put, it is true that using dental floss will not remove the biofilm from your teeth that is responsible for tooth decay, gingivitis, or gum disease. All by itself, dental floss will not get rid of gingivitis, nor periodontitis. It will not prevent cavities. It’s not a super weapon against any of these things. What it is, is an additional tool that, if used correctly, can and will get chunks of food out from between your teeth that can contribute to plaque, which is what does actually lead to gingivitis, periodontitis, and cavities. It will get rid of the food stuck there that makes your breath nasty and gross if you leave it there too long. It reaches into places your toothbrush can’t reach. So yes, I still recommend that you floss. I have to, because otherwise, it’s a betrayal of all those years of study, indoctrination, self-delusion, and ignoring the fact that most people don’t do it, and they don’t die from it. And I can’t do that. I have to keep believing that you’ll die if you don’t floss. 😀 No, of course not. You won’t die from not flossing. But I truly do recommend you floss, because it helps keep your teeth cleaner if you do it well. If you don’t….well….you don’t. Don’t feel guilty about it. But please still do it for the week before your dental checkups to impress our wonderful hygienists, ok? They’ll thank you for it. 🙂 And for more tips on how to keep your teeth and gums healthy, check out this article I wrote a few years ago How to Reduce or Prevent Cavities & Gum Disease. Unless you happen to be one of those crazy lucky people who don’t get cavities, but especially if you’re unlucky and get a cavity that grows really fast.